If you’re going to get down to doing an ancestors search, it’s important that you do it right. If you’re helping your kids do their history project of making a href=”http://family-tree-template.org/royal-family-tree/”>a royal family tree or you just want to make your own family tree together with a free printable template, you should prepare in order to have everything ready for the facts that you’re going to find. 1) Always have a starting date – When starting to do a family tree template and deciding to trace your family history, you need to have a person and / or a date that you begin working with, as that is the only way that you will know where to begin. If you are doing the ancestor search of the family tree for your children, you can use yourself or your kids as the starting date for your family history research and then work your way upwards or downwards in your family tree chart. 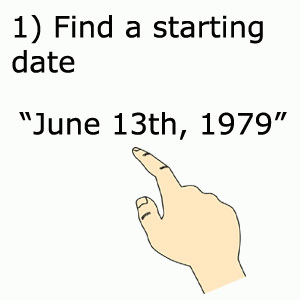 As long as you select the starting date, you will know where to work backwards from. 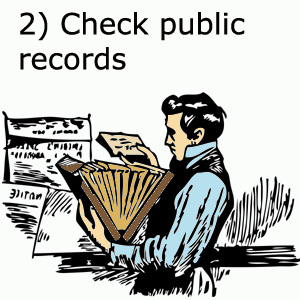 2) Check public records – If you’re going to be doing a search for yourself and your family history, it may be a good idea to take a look at public records in order to be able to find all the information you will need. Your family may not have all of the details on the deaths, births, marriages, divorces, etc., so you will need to find that information. The public records will have all of these things on file, and you can get paper proof that your ancestors were born in such a location at such a time to such a person. 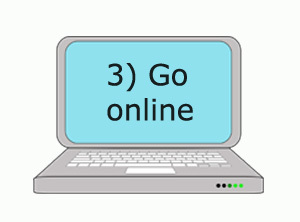 3) Go online – Ancestry.com is just one of the many websites that you can get on if you want to find your ancestors and learn more about your family history genealogy, and the truth is that making your own family tree will be easier if you can find the information online. If you’re making a royal family tree for a royal line from history, you may find that the online encyclopedias like Wikipedia or the Online Encyclopedia Britannica will have all of the information that you will want about the people from history. 4) Ask family members – This is usually best if you are going to be researching an ancestor in recent history, as your family members will often know more about them than you do. If you have a grandparent that is still alive, you can ask them for information regarding their parents. You may just find that some of your relatives will know more about your ancestors than they talk about, and you can glean all kinds of information from them that will come in handy when making the family tree for your kids. Some may even have pictures of your relatives, and you may be able to find very useful information! 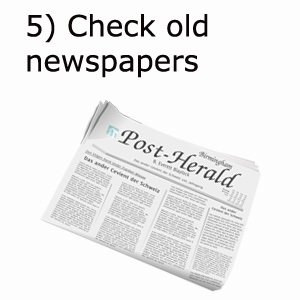 5) Check old newspapers – Newspapers contain all kinds of information, and the truth is that looking through old newspapers can be a great way to find facts about your family. You would do well to know the names of the people that you’re looking for in the papers, but you may just find that some of the older newspapers in the country will have archives that date back a long time. You can search through these archives in order to find any pertinent information on the person that you’re looking for. 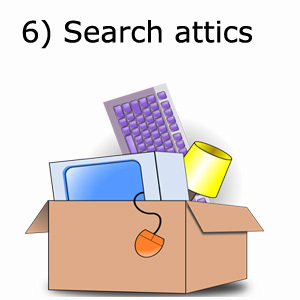 6) Search attics – If you have relatives that have been living in the same houses for generations, you will find that attics are some of the best places to conduct your ancestors search to find information on your family history. Most of these attics will have all kinds of material that your relatives have forgotten, such as pictures of your ancestors, newspaper clippings, and documents of birth and death. You may find that going through one of your relative’s attics can be like hunting through a treasure trove, and you can find all kinds of amazing stuff! Even though it’s hard work, it’s totally worth it in order to find out about your ancestry, your heritage, and the people that made it possible for you to exist today! If you’re going to make yourself a chart with all of your personal ancestry information, it’s important that you organize yourself. There is going to be a lot of information coming in, and that information is going to be challenging to keep neat and tidy. Pedigree Chart – A Pedigree chart is the basic chart for those that want to trace their heritage directly backwards, and you will find that it will help you to narrow down all of the information that you are collecting to your direct ancestors. You will input the information for your parents, then their parents, then their parents’ parents, and so on. There will be no information on siblings or divorces, just the direct bloodlines of your ancestors. It will help you to focus on your heritage and find out where you came from. Family Group Sheet – A family group sheet is much more complex. This sheet involves not only the parents of the main subject of the chart, but it also involves all of their family members. This will give you a much broader vision of the families of the people on the chart, and will help you to find out as much as possible about these immediate relatives. It will show you the big picture of the entire family of the person that is the subject of your kids’ research, and it will help them to discover who was related to that famous personage. These are the two kinds of charts that you can work with, and though there are many more, these are the best to choose from. They will make organizing your information a whole lot easier! If you use a pedigree chart, you will only need to find your immediate ancestors without having to go into all of your relatives and siblings – and their relatives as well. If, however, you want a much broader view of your family history, you may want to make a family group chart that will help you to track all of your relatives for the past generations. It will be more complex and space-consuming, but it will help you to learn more about your family and its history. You will see below how the software will make your life a whole lot easier, but rest assured that using software to help you track your family history can be a great way to cut back on the work. You can find software online that you can either download or use directly on the website, and you will find that there are many great programs to use. Just choose the one that works best for you, and download it to your computer to get started working on your family line. This is going to be the most time consuming part of the entire process, and you’re going to have to work hard to find all of the information. 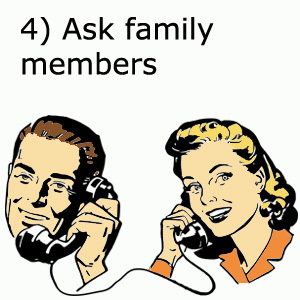 You will need to talk to family members, check out old newspapers, visit the public records, and dig for information. You will probably spend many hours tracing your family genealogy, but you can find all of the information you need if you work hard at it. Remember that you don’t have to have all of the information you want in order to start putting all of the information you have gathered onto it. You can start filling it out the moment that you trace your grandparents back to their ancestors, and you will find that filling it out as you go will actually make it a lot easier for you. You can see how much progress you are making, and you will be able to find where you are missing people or information. It’s actually quite simple to begin making your own family tree, though the research is what is going to take you so long. The truth is that you can find out all of the information that you need to fill out your chart, but it is going to take you a whole lot of work and digging. It will, however, be worth it, as it will help you to find out more about your ancestors, your heritage, and where you really come from! Above we mentioned software that you can use to help you organize your family tree, but the truth is that this software is one of the best things that you can use to help you research your family tree information as well as put it together. The great thing about software is that it’s designed to work with other programs, meaning the databases containing your family’s information from your research will be easily integrated with other databases that are available online. The software also comes with a whole range of charts and templates that you can use, and you will find that it will make organizing all of your information a whole lot easier. You won’t have to worry about having too many little boxes filled with information or notes, as you can store all of the information in each person’s separate category and only display the name of the person. You will still be able to access all of the important information that you want to get your hands on, but it will be much easier thanks to the fact that the information is at your fingertips. You can easily add new information to the notes that you have already posted on each page, and it will be much easier for you to keep your family tree updated thanks to the software. You may have to pay for the software that you will work with, but it will make doing the research into your family tree so much easier. You can share the information with others that are doing similar projects, and you will be able to access many databases that contain information that is shared by other users that have done research into their family histories. If you are making your own family tree, you may just want to work with family tree software to make your life a whole lot easier!